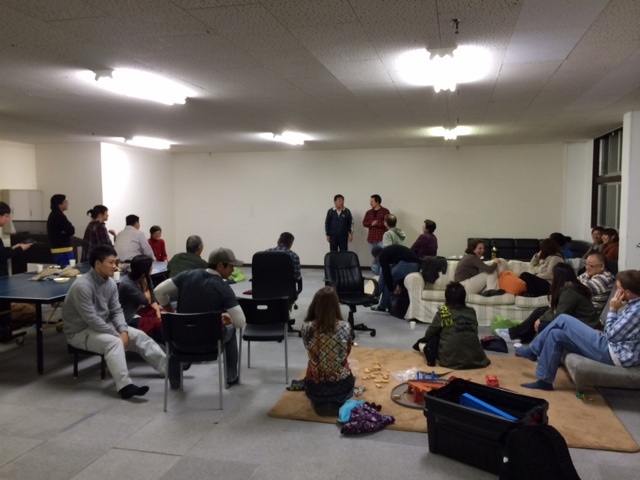 Tonight we had a last minute dinner gathering hosted by the team from Singapore that is up here with us for three days. 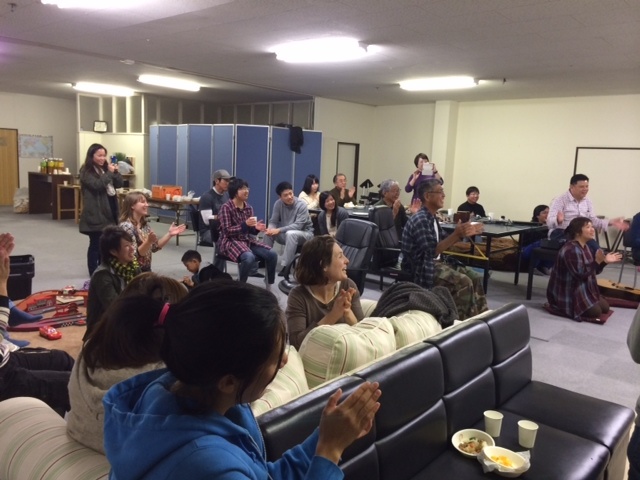 We invited our friends and their families at the Nozomi Project, called a few regulars, and prepared for the possible maximum number of guests we could imagine — 60. (With just our team, kids, and current volunteers, we have close to 40!). The Singapore team, led by their member Chi who is a chef by trade, made a Singapore stew for us that was really delicious. And between 6 and 7 pm, A LOT of people came through those doors! The last father and daughter guests who came quite late ate the last of the stew. Before them, there could have been 70 or more who had a hot bowl of delicious Asian cuisine. What made tonight so special was the strange and beautiful mix of cultures and spontaneous fun that emerged (when I left with our four kids a ping pong tournament had just started!). Our Singapore friends sang a beautiful song in Chinese for us; two members of the Hawaii team shared a few words; we were surprised after that when the dad of one of our Nozomi staff stood up and wanted to sing a song… perhaps his daughter was the most surprised! Her dad had had quite a bit to drink (he had brought his own big bottle of sake) – so she wasn’t quite sure what he would do or say! At the end of his song, he shared how very thankful he was for the Hawaii team and Be One team that a year and a half ago crawled under his floors and pulled out tsunami grime and refinished his home. During dinner we had watched a short video clip of a celebration BBQ we had had in front of his home at that time to celebrate the refinishing. It was fun to see the other members of the Hawaii team who had been a part of that, as well as several other teams who had all been serving together. As he got to the part of sharing about volunteers crawling under his home, his voice broke. And he cried in front of all of us. His family had known even at that point that the government was going to make them tear down their home (it is too close to the water in the case of future tsunamis); but the love shown him through those acts of service in repairing his home for whatever time left they have to live in it, gave him hope again to keep going. We were all so moved by his sharing. One of the more mature members of the Nozomi Project, N., sang a song about her hometown, Onagawa, that was almost completely washed away. 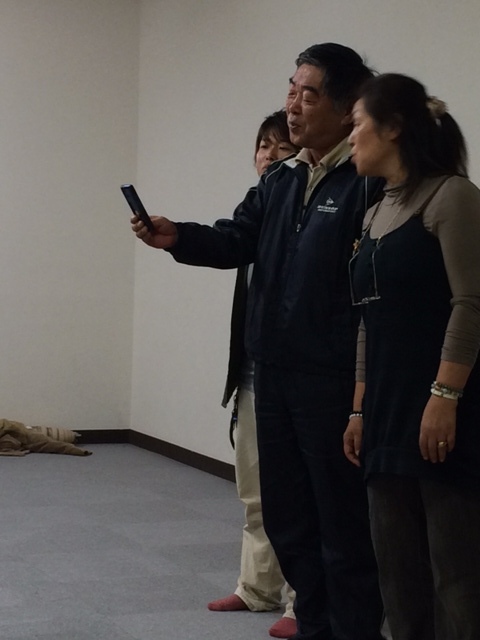 Then she and two other Ishinomaki friends sang the very famous “Suki Yaki” classic. At one point tonight N. pulled me aside and said, “you know how you told me last weekend that you and Eric and others from Be One are praying about possibly sending a team to the Philippines to help? Well, I think my husband would like to go if you do that.” Her husband lost his mother and their home in the tsunami. He almost lost his wife. Last year he got angry at his wife after she had started working at Nozomi for becoming too happy, too soon. Last weekend they came together to worship with us on Sunday; tonight came to a Singapore dinner; and his heart is opened to go to another country and serve. God’s ways are so beautiful. We don’t know if God’s plan is to have us send a team, but either way — I love to see God at work in so many wonderful ways.